A handsome coffee-table sized, hardcover book that tells the rich history of football at the University of Michigan will be available Aug. 1. A certain Hall of Fame-bound quarterback, however, who has gone on to marry the world’s most famous supermodel and graced the cover of hundreds of national magazines, is mentioned on exactly one page, in a few small paragraphs, with no photo. “How can that be?” Pats fans have asked me when I’ve mentioned the book, for which I led the production. They seem insulted that Tom Brady isn’t featured in a book that chronicles the history of the program where he was a quarterback from 1997 to 2000. Brady backed up quarterback Brian Griese during the 1997 national championship season, and he was locked in constant battle for the starter position with Drew Henson his senior year. He never had the time to shine in the spotlight of college football, which is largely why he didn’t get drafted until the sixth round of the 2000 NFL draft. His only mention in the book, “Michigan Football: A History of the Nation’s Winningest Program,” is on the 2000 Orange Bowl page when Michigan beat Alabama in overtime 35-34. “Not surprisingly, it was Tom Brady, the senior leader who fought tooth–and-nail just to earn the starting job, who delivered the win,” the story says. Stephanie Steinberg was the 2011 editor in chief of The Michigan Daily. Email her at Stephanie.Steinberg@globe.com or follow her on Twitter. About the book: “Michigan Football: A History of the Nation’s Winningest Program” contains stories and photos of the University of Michigan football team that were printed in The Michigan Daily, the school newspaper, from 1890 to 2012. The soft cover is available online at Amazon and Barnes & Noble. 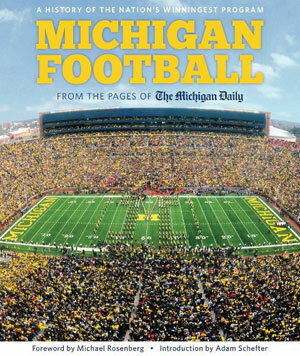 The hard cover will be sold on michigandaily.com/store starting Aug. 1. Visit the book's web site.